hen socialist global financier and socialist philanthropist and Open Society Institute founder George Soros hosted 2004 Democratic presidential nominee Sen. John Kerry [D-MA], Soros invited him to his private retreat in the Hamptons where "buyers and sellers" can talk without reporters overhearing quid pro quo conversations that might not be construed as legal to the wrong ears. When Soros hosted a major fund raiser for unknown Illinois State Senator Barack Hussein Obama in the fall of 2004, the soiree took place at his New York home. That evening Soros wasn't buying either a President or a prospective US Senator. He was simply fishing in a new political stream. Soros intended to snag the young political fish, reel him in just a littlebut keep him on the hook, letting him grow until he was mature enough to fit Soros' plans. And what were his plans? It appears Soros, who was born on Aug. 12, 1930 in Budapest, Hungary, would like to President of the United States. Of course, because he is not a natural-born American, he has to be content to be a surrogate presidentthe puppet master who pulls the strings of the man in the Oval Office. Soros wants to be Barack Obama's Col. Edward Mandell House. House was the change agent for Thomas Woodrow Wilson and Franklin Delano Roosevelt. He was also the impetus behind the push by Wilson to form the League of Nations because House convinced him if he did so, Wilson would become the first President of the World. And House was also behind FDR's efforts disguise the global League of Nations into what was to appear to be the more benign, Americanized United Nations when, in fact, it was merely the League of Nations in a red, white and blue suit of clothes. Soros and his family kicked in $60 thousand to help State Sen. Obama drum former Ambassador Alan Keyes in the 2004 Illinois US Senate race 70% to 30%. (Obama handily won not because he was that good, but because Keyes, who is much too honest for politicsparticularly corrupt Illinois politicswas that bad.) Keyes thought you could tell the voters the truth in Illinois and get elected to public office. Obama knows when you are a citizen of the world posing as an patriotic American, you never tell the voters the truth. You tell the voters what they expect to hear in order to get their votes. Obama met with Soros in in what appears to be their first meeting in the philanthropist's mid-town Manhattan office on Dec. 4, 2006. Soros offered his financial support for an Obama bid for the White House and urged Obama to join the fray before the anticipated announcement by Sen. Hillary Clinton who had been testing the mood of the voters since early 2006. After their handshake, Soros took Obama into a conference room where about a dozen bankers were waiting to meet him. Among those dignitaries was the US head of Union Bank of Switzerland (SwissBank), Robert Wolf, and hedge fund manager Orin Kramer. A week after that meeting, Wolf met Obama for dinner in Washington, DC to map out a campaign strategy that would put Sen. Barack Hussein ObamaAmerica's first Muslim-born African-Indonesian (since he has dual citizenship)in the White House. Soros knew Hillary Clinton would make her official announcement shortly after the holidays. He urged Obama to jump into the race before Clinton in the hope of snagging media-ordained front-runner status. It is unclear what caused the rift between the Clintons and Soros, because initially Soros backed both candidates. Clinton lost much of her big money supportincluding Soros as the ballots were being counted in the New Hampshire primary. The Rockefeller-controled banking interests pulled most of their financial support from Clinton and gave it to Obama. The bank flip-flop included Goldman Sachs, Morgan Stanley, Citigroup and JPMorgan Chase (Chase Morgan). Interestingly, those same banks threw their financial support (in lesser amounts) behind Sen. John McCain as well. After New Hampshire, the campaign finance filings of Sen. Obama showed the wealthiest banks and bankers were now bankrolling him. So, for that matter, were some of the world's biggest "Washington influence buyers." Most of those dollars shifted from Clinton to Obama on the eve of New Hampshireeven though Obama lost the night. In honest politics, it doesn't happen that way. Obama was now completely and safely tucked away in the hip pockets of the globalists who are determined to erase the Bill of Rights by 2012 and fully implement a socialist world government during Obama's first term in office because they know, like Jimmy Carter before him, if they don't succeed, Barack Hussein Obama, who was nominated as the Democratic standard bearer by acclamation and not by ballot will not get a second term. The "aye" voice affirmation was done to prevent disgruntled Hillary Rodham Clinton delegates and wavering super delegates (who might have second thoughts about backing an inept communist citizen-of-the-world and Muslim sympathesizer) from attempting a convention coup and nominating Clinton whom the money barons were convinced could not win in November or, probably, ever. Hillary Rodham Clinton, who is now searching for her new role in the political hierarchy of the left, defied the odds by eking out an almost impossible 39% to 36% victory over the Illinois newbie in New Hampshire, but the money barons had already decided that Obama would be more capable of delivering them the prizea merged North American Union of nationsthan Clinton, who is probably the most despised and mistrusted woman in America and whom the already solidified anti-Clinton conservative base would ferociously resist from the first day as the 44th President of the United States. So, for that matter, would the members of her own party who did not like domineering, dictatorial First Lady and self-proclaimed co-President during the Clinton years. In early March, Soros arranged two more fundraisers. One was hosted by Robert Wolf and the other by Edgar Brofman, Jr. Brofman is one of the heirs of the Seagram's liquor fortune and head of Warner Music Company. Following the fundraiser Soros (whose birth name was Gyorgy Schwartz, and who was born into a Jewish household) wrote an article in the New York Review of Books in which he lambasted the conservative America's Israel Public Affairs Committee's denouncement of Hamas. In the same type of ploy instigated by J.P. Morgan, then one of the two most hated and feared men in America, when he secretly backed Thomas Woodrow Wilson and Teddy Roosevelt's Bullmoose Party in 1912 while he was openly contributing money to President William Howard Taft to tie him to the barons of business and banking. Wilson declared himself to be the "candidate of change." He painted himself as being the only candidate who was really "in touch" with the working class. Does any of this sound familiar? In order to distance himself both from Soros and his Muslim birth, and to make it appear to the public that he was pro-American when Obama is, in fact, as transnational as the globalists who are filling his campaign war chest (with millions of dollars that must be repaid to them in quid pro quos when, by hook or by crook, he wins the White House), Obama denounced Hamas (after having an emissary assure the Muslim world that he didn't mean the campaign rhetoric he was spouting)and he also rebutted Soros for his anti-Israeli remarks. Soros rewarded his lackey with another major fundraiser, this time at the Greenwich, Connecticut mansion of hedge fund Tudor Investment Corporation billionaire CEO Paul Tudor Jones. Three hundred A-list guests were in attendance to meet Soros' new political protege. And each paid $2,300.00 to speak with the "citizen of the world." 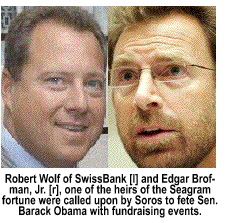 The soiree netted the Obama Campaign $690,000. Not bad for an evening's worth of liberal banter and lies. Obama's deceitand not just with respect to his pretentious public show of support for Israel is just thatduplicity. Obama is as anti-Jewish as he is anti-white. Obama has questionable ties with the global Muslim community that would be hard to explain to the American people in a post-WTC world. 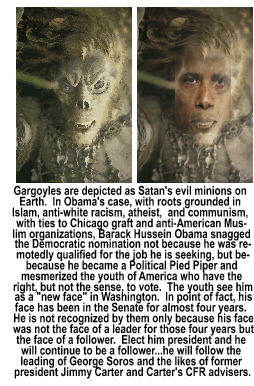 On Nov. 5, 2006 the Chicago Sun-Times broke the story that freshman US Senator Barack Obama had been involved in a shady real estate deal with Syrian-born Antonin Tony Rezko. Rezko came to the United States as a penniless immigrant at age 19 in 1974. When his disembarked from the plane he could not speak a word of English. In 1989 Rezko was dabbling in slum properties and became a well-known Chicago slumlord who took a young community activist named Barack Obama under his wing in 2000 by giving him a job cleaning slum properties and preparing them for tenant occupancy . In addition to several dilapidated apartment buildings, by 2002, Rezko also owned both a Panda Express franchise and a Papa John's franchise. In June, 2003a few months after Obama announced his candidacy for the US Senate seat held by GOP banking heir Peter Fitzgerald who declined to seek reelectionRezko held the first of many campaign fund-raisers for his protege. The most important of these took place early in 2004 according to the Chicago Tribune. Rezko set up a meeting between Obama and a group of Middle Eastern bankers. When the New York Times learned about the meeting, Rezko told the Times that the Islamic bankers were potential investors for a business venture he was putting together. Although all parties have denied it, one of the bankers who met with Obama that day was none other than former Saddam Hussein underling and now British banking tycoon Nadhmi Auchi, the head of General Mediterranean Holding Co. What was Obama doing there? He was being vetted by the bankers to determine if he would be a good investment for them. (i.e. : Would the bankers get a good enough return on their money to make supporting Obama a profitable venture. Once again, no one contributes thousands if not millions of dollars to any political candidate out of patriotism or benevolence. They do so only because they expect that politician to deliver even more money back to them. The more money the donor gives, the bigger debt the politician must repay.) Obama said he could not recall the meeting, adding that he only remembered being invited to one private meeting with Rezkoand that was to discuss appointments of worthy individuals to state jobs, boards and commissions which, of course, smacks of spoils system cronyism. 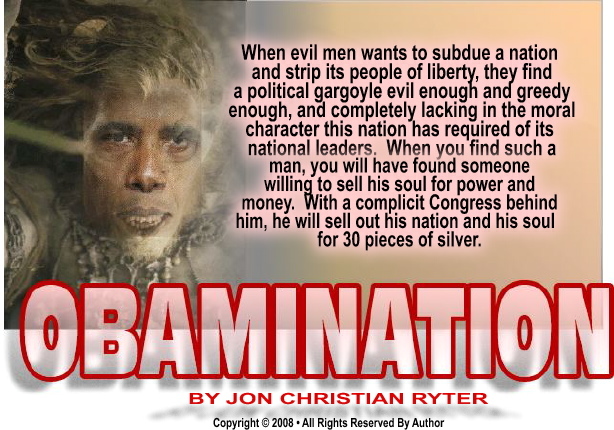 When the liberals took over the Senate in Nov. 2006, the Democratic Caucus unveiled a list of new ethics reforms they planned to implement and named Obama as the point man on ethics reform in the US Senate. That would be like FDR naming John Dillinger head of the Fed. After Rezko was indicted, Obama began ditching Rezko-linked straw-donor contributions by donating them to various charities. The Obama campaign told the Chicago Tribune that "..We have tried towhat we have done is, we have tried to exercise an excess of caution subsequent to those disclosures. So any money that we can trace to Tony we have disgorged." In more honest words, it appears what the Obama campaign meant was, if someone could prove the money came from Rezko or from a Rezko straw donor, they got rid of it so they could declare they had "clean hands." But it appears all Obama dumped was between $160,000 to $180,000. Not dumped was a $3.5 million "loan" in May, 2005 to Obama from former Iraqi Oil Minister and arms dealer Nadhmi Auchi, that was funneled to the Obama Presidential Campaign through Rezko. In September, 2005 Auchi's General Mediterranean Holding Co. advanced a "loan" of $11 million to Rezko followed in April, 2007 by a third loan, this one for $3.5 million. With this loan came an agreement between Auchi and Rezko that forgave a total of $27.5 million in loans from Auchi in exchange for a stake in Rezko's 62-acre Riverside Park development. According to the London Times in a Feb. 1, 2008 article, Rezkoand Obamawere financially tethered to GMH chairman Nadhmi Auchi. The May 23, 2005 payment of $3.5 million (£1.8 million) from Auchi was funneled to Rezko for Obama through a Panamanian company, FinTrade. The money was designated as a "loan" to US Senator Barack Obama. On the Board of Directors of FinTrade was Ibtisam Auchi, the wife of Nadhmi Auchi. At the time of the "loan" to Obama, according to federal court papers, Rezko attempted to get a US visa for Auchi after the Iraqi tycoon was convicted of fraud in France. Auchi denies that he sought help to get a visa, and Obama aides insist no one approached the Senator for help. Steve Rhodes of the Beachwood Reporter in Chicago pointed asked: "You're Tony Rezko and you've bankrolled Barack Obama's entire political career. You helped him buy his house and you and your wife socialize with him and his wife. You've held a reception for a potential investor in which you invited Obama, who had just been elected to the United States Senate, to impress your business partner. And you appeal to Illinois officials to help him get a visa. Are you telling me you do not ask Obama's help?" Of course, you do. In the parlance of politics, that's called a quid pro quo. It's illegal, but that's how political contributions are repaid. No one supports political candidates out of the benevolence of their heart. Everyone's in for the big bucks. On Nov. 5, 2006 the Chicago Sun-Times interviewed Obama about his relationship with Rezko. The Sun-Times asked Obama: "Have you or your wife participated in any [transactions other than the purchase of your home] with Rezko or companies he owns? Have you or your wife ever done any legal work ever for Rezko or his companies?" Obama answered, "No." The Sun-Times asked: "Has Rezko ever given you or your family members gifts or any kind and, if so, what were they?" Again, Obama answered, "None." It appears, in Chicago parlance, receiving $160 thousand in straw donor contributions did not constitute participating in transactions with Rezko, nor did receiving $3.5 million in campaign contributions for his US Senate run. Or, for that matter, did executing the legal paperwork to protect Rezko from the slum tenants renting hundreds of decaying Rezko apartments since, technically, the work and the billing was done "by" the law firm Obama worked for and not Obama himself. Why would Saudi Prince Alwaleed or his agent, Dr. Khalid Abdullah Tariq al-Mansourbe interested in funding the college education of a half-white, half-black Marxist-atheist who claimed to be a born-again Christian? Likewise, why would an Iraqi-born, Saddam Hussein underling who was also tied to the Nation of Islam in the United States not only fund Barack Obama's US Senate race, but kick in what appears to be $3.5 million (£1.8 million) Obama contribution in April, 2007? Could that explain why citizen-of-the-world presidential candidate Barack Obama demanded that all Obama Campaign staffers and volunteers not wear US flag symbols? 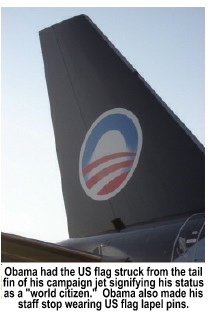 Or why he removed the US flag from the tailfin of his campaign jet plane? Or why, candidate Barack Obama refuses to pay homage to the US flag or the US anthem? Does this also explain why there is overwhelming support in the Saudi kingdom for Obama? Both from Saudi nationals and Muslim expatriates who live in the Kingdom? Most Saudis believe Obama is a Muslim. Some Mideasteners attribute that belief to his middle name. Some say they prefer him only because they view him as the lesser-of-two-evils. Many, like Jordanian expatriate Adel Abdullah thinks that "...whoever occupies the White House will continue the same policy that the US has been pursuing for years. This means," he added, "that we will continue to see the Palestinians and Israelis involved in an ongoing conflict." . Obama's birth and ethnic roots continue to be a cause for concern in the United States. 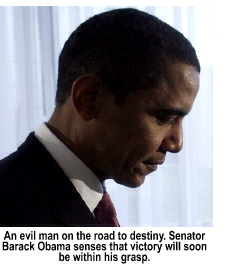 On August 21, 2008 former Pennsylvanian Deputy Attorney General Philip J. Berg filed civil action 08-cv-4083 against Sen. Barack Obama in US District Court seeking a declaratory judgment and an injunction, arguing that Obama does not meet the qualifications necessary to become the 44th President of the United States. Far from being a crackpot attention-seeker, Berg is the former head of the Montgomery County Pennsylvania Democratic Party, and a former member of the Democratic State Committee. In his lawsuit, Berg argues that Obama is not a natural born citizen of the United States as defined by US law, that he lost any right to citizenship when he was adopted in Indonesia, and/or holds divided national loyalties because he holds dual citizenship in both Indonesia and Kenya. Hawaii became a state on Aug. 21, 1959. Stanley Ann Dunham was born in Fort Leavenworth, Kansas on Nov. 29, 1942. She lived continuously in the United States until the end of 1960 or early 1961 when her parents moved back to Hawaii where she met Barack Hussein Obama, Sr. Dunham was 17years old when she met her son's father. She was 18 years, 8 months and 4 days old when she had her son. Under the Immigration and Naturalization Act of Dec. 24. 1952, a child born to one US citizen parent and one alien parent, the US citizen parent was required to have been physically present in the United States or its outlying possessions for 10 years prior to the child's birth, with at least 5 of which were after the age of 14. Under that law, Stanley Ann Dunham could not transmit citizenship to her son, Barack Hussein Obama, Jr. since she would had to have been 19-years of age when she gave birth. She was 18-years, 8 months and 5 days old on Aug. 4, 1961. However, in 1986, Congress decided the restrictions in the Immigration and Naturalization Act of Dec. 24. 1952 were too onerous, and amended the law . The 5-year provision was reduced to two. In 1994 the provision was reduced again. This time, from two years to one. That provision has remained unchanged for the past 15 years. Under US immigration law, a child born to a natural US citizen born anywhere in the world (fitting the criteria outlined here), is construed by US law to be a natural citizen only if they meet the criteria outlined above. If he met those criteria, it would does not matter if Obama was born in Hawaii, Indonesia or Kenya. Nor would it have mattered ithat the birth birth certificate posted on Daily KOs is a copy of an original (which it declares itself to be) or a Certificate of Live Birth (which iit is not)) or even a forgery. The surprise pick of Gov. Sarah Palin [R-AK] as Sen. John McCain's running mate crushed Obama's post-convention "bounce" in mid-bounce. Obama posted a 9 point gainfor about six hours. Then, depending on which poll you looked at, the bounce dribbled to a 3 point to 6 point lead. Why would the pick of an opposition running mate cripple a presidential nominee's convention bouncebefore the other party's convention even got underway? Why couldn't Obama close the sale during the Democratic Convention? Because when your rhetoric is a yard wide an a quarter-inch deep, the American voters, who pay more closer attention to nominees than they do candidates, were able to see through the Obama-hype, the Biden-hype and the liberal media-hype in Denver. While the media insisted Obama convinced the American people that he was someone who shared their values, was up to the challenge of dealing with geopolitical and geo-military issues, Obama's only real gains were on the celebrity-enthusiasm scale. Obama scored well with the celebrity-chasing youth of America18- to 22-year olds with the right, but not the sense, to vote in a national election. And that is the fault of Congress which changed the voting age from 21-years to 18-years of age during the Vietnam Era because the far left knew 18-year olds who were subject to the draft would vote for the far left candidates who wanted to end the Vietnam War. The Hollywood-staged script, aptly entitled the Democratic National Convention, was supposed to make the American people believe a man who removed the American flag from the tail of his jet plane and refused to allow any member of his campaign to wear US flag lapel pins because they might offend someone, was a patriotic American after he denounced his country in Europe and declared himself to be a "citizen-of-the-world." Obama entered center stage during the primaries demanding change from the Washington elite status quo, suggesting by his rhetoric that he was a new face on the political scene who was not corrupted from cronyism or quid pro quo politics. Obama suggested his lack of experience in national politics as an advantage. Clearly, as shown thus far, when you are weaned on Chicago politics, you are already a master of quid pro quo politics the day you arrive on the national scene. Intelligent voters know that change, in the Obama vernacular, simply means placing a Democrat rather than a Republican in the White House. Change, in the Obama vernacular, simply means eliminating private healthcare by replacing it with government controlled HillaryCare disguised as ObamaCare in which Obama, not Hillary, profits from the no-bid contracts to healthcare providers. ObamaCare, like Clinton's failed Health Security Act of 1993 will clone the failed Canadian healthcare system that was just jettisoned by the Supreme Court of Canada because Canadians had to wait months for catastrophic health care and sometimes years for what was construed by the Canadian government as unnecessary "elective surgery." Elective procedures in one case was a hip replacement needed by 57-year old retired Canadian businessman George Zeliotis. Zeliotis suffered intolerable pain from an immobile knee. In the view of the government healthcare administrators, Zeliotis was an old man who had only a few years of life left, thus it was a waste of government resources to waste an operation. Barry Stein, a Canadian lawyer with metastic colon cancer was placed on a surgery and chemotherapy waiting list. Despite the death sentence he was facing, Stein's surgery was postponed three times because of "hospital overcrowding." In the Canadian system, it's "first-come, first-serve." This is the healthcare system Obama promises to implement when he is elected. Change, in the Obama vernacular, means permanently replacing the rule of law with "economic justice" (i.e., social justice) which means punishing those who are successful by taking their sweat-earned wealth and distributing it to those who believe they are entitled to a free ride in America because their ancestors got free rides to America in the cargo holds of slave ships. But, most of all Obama could not close the sale at the Democratic National Convention because the pieces of the puzzle don't fit for anyone who is actually trying to put the whole picture together. In the pomp and ceremony of the Democratic National Convention, the far left attempted to appear patriotically American when the view of America held by the Democratic Party today must be viewed through the prism of Marxism to make sense. Promising tax cuts for the "middle class" (which in liberalspeak mean the working poor since the middle class is construed to be the rich), Obama, like all Marxists, plans to tax the free enterprise system into submission to the federal bureaucracy. Small business owners who always feel the brunt of all "big business" tax increases by the left, know tax hikes never help the market economy, never increase jobs, and never improve the lot of working class Americans, know Obama's agenda for America does not make political sense. American investorsmost of whom are working class stiffs whose "investment portfolios" are their Roth IRAs or 401K pension plans, know Obama's planned assault will focus on middle class US investors (touted as fat cat rich guys) while those with real wealth are protected from abusive taxes by tax shelter loopholes created by liberal politicians who need their money to remain in office. The "rich man's" tax increases will impact more than 50% of households in the United States of whom most are those who are generally construed to be Republican voters. The ultra rich, whose families are the founding members of the Grand Ol' Party, jumped ship from the GOP in 1932 and now bed down with the Democrats. Most of Obama's planned tax cut to "moderate-income" families will actually be in the form of welfare giveaways that will come from reimplementing generational welfare, and by authorizing a new round of tax credits for those who don't pay any federal taxes. Today, thanks to tax credits, 15.3 million low income families who don't pay into the federal tax system receive tax refunds. Obama's plan would increase that number to close to half of all American tax payers. The slack will not be taken up by the rich, who pay no taxes on their accrued wealth, it will be taken up by the "rich Americans" who earn from $55 to $200 thousand per year. You now have an inkling why Barack Obama has been labeled the most liberal member of Congress. Obama's voting record in the Illinois State Senate and his emerging voting record in the US Senate confirms it. Somehow, the real Barack Obama does not gel with the pastose pastel of the man etched by the public relations gurus at the Democratic National Convention. And that's why Barack Obama could not close the sale at the convention. On the primary trail, Obama spoke passionately about economic justice. Most listened to the fervor of his positions on issues but not the words he spoke, nor the meaning of those words. They "heard" the high-minded rhetoric that never matches the realities that follow the words once those who utter the promises gains office. When Obama spoke at the 99th annual NAACP Convention in Cincinnati, Ohio on July 14, 2008 he said: "I've been working my entire adult life to help build an America where economic justice is being served. [As president] we'll ensure that economic justice is served. That's what this election is about." In Obama's mind, that was the only real change he intended to implement if he was electedusing his liberal collaborators in the US Senate to entice or force conservative judges to resign and replace them with jurists with social justice credentials. Obama promised he would return a year later on the NAACP's 100th anniversary and "...stand before you as the President of the United States of America. At that moment you and I will truly know that a new day has come in this country we love..." The re-establishment of the welfare society with a whole new battery of entitlements for the disenfranchised of America. For those who don't understand the definition of "economic justice" it is the means by which government bureaucracies punish a successful middle class by seizing and redistributing the fruit of their labor. In Audacity of Hope, Obama said he intends to "...recast the welfare net that Franklin D. Roosevelt and Lyndon B. Johnson cast, while rolling back the winner-take-all market economy that Ronald Reagan reignited." Obama seems unaware that under Reagan's market economy this nation experienced a quarter century of economic growth (for which Bill Clinton and the liberal media claimed credit). Reagan's market economy netted record increases of the standard of living for all Americansincluding those at the bottom of the economic ladder. Life is a series of choices we all make on the forked road through life. Each choice takes us down a new path with new consequences for each decision we make. Some are good, some are bad. But, they are our choices. The Constitution of the United States promises every citizen the opportunity to succeed. It does not guarantee success, only the right to compete. For that reason, I am not responsible for your failure, nor are you responsible for mine. You don't owe me a living if I am not successful, nor do I owe you a living if my sweat investment in my vocation produces more tangible results than yours. Obama and his wife Michelle are both socialists. Not the democratic garden variety of socialists, but the communist, rotten-to-the-roots variety. It's clear from both of his books that Barack Obama is a firm believer in class envy. So is Michelle Obama who believed that even though affirmative action was her rite of passage into Princeton, the ivy league blue bloods looked down on her because she was black. In her senior thesis at Princeton, Michelle LaVaughn Robinson observed that: "I found that at Princeton no matter how liberal and open-minded some of my white professors and classmates try to be towards me, I sometimes feel like a visitor on campus as if I really don't belong..." Michelle Obama's problem interacting socially with white professors and white classmates was not due to the color of her skin as she thought. It was solely because she was an affirmative action student. Her education was funded by white taxpayers for whom she felt a lifetime of contempt. The uncomfortable uneasiness she felt around her peers at Princeton was due to the societal gap between the A-list elites at Princeton and the poor kid from Chicago. But to Michelle Robinson Obama, it was always about skin, not economic breeding. Michelle Obama's contempt for Caucasians shows in her private rhetoric and her willingnessand her husband's willingnessto associate with anti-white and anti-Semitic racists. Michelle Obama, who is not known by Chicagoans as a nice person, let her private rhetoric slip into the public domain on May 5, 2008 in a campaign speech delivered at Trinity United Church of Christ. Obama launched a diatribe against "whitey"a racist term she used several times in the speech to describe America's "rich white middle class." Her husband's prejudices show as well when the man who wants to lead America wrote in Audacity of Hope: "I will stand with the Muslims should be the political winds shift in an ugly direction." This is the same man who claims he is prepared to take an oath to protect and defend the United States against all enemies, foreign and domestic. Those foreign enemies, right now, are Muslim. I wonder what, in Obama's mind, constitutes an "ugly direction?" On the economic front, Obama talks about "restoring fairness to the economy" whenever voters talk about NAFTA, CAFTA or GOTCHA. Obama, who was a "community organizer" when NAFTA was enacted in November, 1993, wants to renegotiate the trade deal that was signed into law by Bill Clinton. Obama's running mate, Joe Biden, was one of the cosponsors of that legislation, and while Biden voted against CAFTA, he voted for NAFTA. And, while Obama talks about repealing NAFTA to crowds of unemployed factory workers, the simple truth is that as a Marxist, Obama is adamantly convinced that government must redistribute the bountiful slices of the pie to the deserving, hungry people in the third world. Like the rest of the Marxists in the US House and Senate. Obama is too smart to openly admit the left believes the redistribution of wealth must be a global thing. Instead of talking about redistribution of your wealth and mine, they talk instead about making "investments" in the emerging nations in order to make the United States more competitive. They also claim the "investment" will create more jobs in America as the new wage earners in the third world demand all of the material things Americans have enjoyed for the last seventy-five years. The "investments" they are talking about are our jobs. When Michelle Obama spoke before the Democratic National Convention, she talked about her husband's role as a community organizer and of attending a forum in which Barack spoke "hope," she said, to frustrated men who could not support their families. "Barack stood up that day," she said, "and spoke words that have stayed with me ever since. He talked about 'the world as it is' and 'the world as it should be.' And he said that all too often, we accept the distance between the two, and settle for the world as it iseven when it doesn't reflect our values and aspirations." Barack Obama's Marxism was learned on his mother's very socialist knee and from the instruction of his socialist white grandparents and not from the pulpit of Jeremiah Wright's church. The Marxist black liberation theology which encourages a victim mentality in the Black community that constantly gnaws at his gut, was something Barack Obama picked up along the way from two of his communist mentors. First was his close friend and Weather Underground leader, Bill Ayers. Second, Obama's Marxism came, according to statements in his first memoir, "Dreams From My Father," from his childhood mentor, Frank Marshall Davis, a member of the Communist Party USA (although he would never publicly admit the association), who fled from the FBI when the government began investigating his direct involvement in subversive un-American activities. David fled to Hawaii in 1951 and continued his work for the Moscow-controled CP-USA for 40 years. Davis met Stanley Ann Soetoro in 1970 when she returned to Hawaii as a divorced mother of two. Without a father-image to influence his life, Davis became Obama's mentor and teacher. Second was former radical Chicago community organizer whose 1971 book, "Rules for Radicals" was the Bible for the Vietnam Era radicals like Bill Clinton, Nancy Pelosi, George Miller and, most of all, Wellesley College student Hillary Rodham whom he tried to recruit as a radical left organizer in Chicago in October, 1985. Although she did not join him, Hillary's senior thesis was about Alinksy. Seventeen years later another young Marxist radical was offered a job as a community organizer in Chicago. Of course, by this time Alinsky was dead. He died in 1972. The offer came from former radical Weather Underground ringleader, Bill Ayers and Jean Rudd, board members of the Woods Fund. Rudd appointed Obama to the Woods Fund board. The job paid an annual stipend of $13 thousand. On top of that, Ayers gave the Developing Communities Project a $24 thousand grant to hire Obama as an organizer in economically-depressed South Chicago where Tony Rezko's slum tenement apartment buildings were being handled by Obama. This is the "Barack Obama" Barack Obama does not want the voters to see. Obama sees himself in precisely the same manner as the groupie celeb-seeking 18-to 22-years olds who worship him see himas a celebrity messiah that is going to make the world perfect for generations to come. Obama made it easy for them because Obama actually has a messianic complex. He thinks he is the Messiah. But he is not everyone's Messiah, and does not profess to be. He is the messiah of black liberation theology. He promised the NAACP he would return for their 100th Anniversary celebration in 2009 and, he said, I will "...stand before you as the President of the United States of America. At that moment you and I will truly know that a new day has come in this country we love..." Will the help of the greatly expanded Democratic majority in both the House and the Senate, that will be the day that the redistribution of wealth in the United States will begin in earnestif Sen. Barack Obama realizes his messianic dream because, you see, it never was the dream of his father. It was his dream all along.